Choose from general and special purpose snap-action, tactile key, miniature, sub-miniature, thumbwheel, and DIP. OMRON ELECTRONIC COMPONENTS G8JN-1C6T-DC12 AUTOMOTIVE RELAY, SPDT, 12VDC, 35A (1. Omron 12V 35A Automotive Relay. ). The interlocking design on the harness allows multiple harnesses to be coupled together for organization and ease of setup. 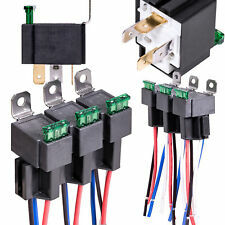 Heavy-duty impact molded relay socket with 5 WIRES. 12V 5 Prong Relays with 5 Prong Sockets wires. 2 x 12V 40A Waterproof Relay & Socket kit. These are the heavy duty 40A 12V waterproof relay & socket kit. Color coded wiring allow easier to identify the color of wire. 40A 12V for heavy duty usage. High Quality ground distribution block wired with 8 gauge cable. 12 gauge relay output wires. Wires are grouped together - power, relay trigger. 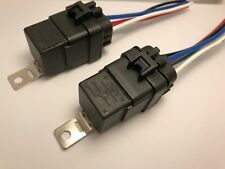 Complete Waterproof Relay/Fuse Block - Fully loaded and Wired using high quality Cross-Link XLPE Automotive Wire. Rated Current : 40A;Input : DC 3-32V. Output : AC 24-380V. Reply within 24hours. SongChuan General Purpose Relays SPNO 20A 12VDC, 303-1AH-C-R1-U01-12VDC. Manufacturer : Song Chuan. Type : Ultra Micro ISO Relay. Series : 303. 1 reset button & 1 general use button. Can be directly connected with Raspberry Pi. 64 different kinds of Resistor. - Red working status indicator for each relay module. Best Value Protoshild board with Mini Board. Power: 1500W (maximum). Relay: 20A. 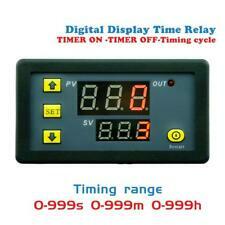 Included: 1 X Timing Delay Relay Module. Timing range: 0-999s,0-999m,0-999h. P0--0:T1 Timing mode is second. P0-1: T1 timing mode is minutes. If item is defective after 3 months, you can still send it back to us. We believe EVERY CONNECTION COUNTS. Manufacturer TE Connectivity Potter & Brumfield Relays. Coil Resistance 144 Ohms. Relay Type General Purpose. Size L x H x D: 32.51 x 27.43 x 27.94 (mm). Coil Current 83mA. 5 Pin SPDT, PCB plug-in type power relay. The relay plays the role as a protector or a circuit switch. Modules can be triggered using the normally open type switch or a sensor. High current load (250V AC 10A or 30V DC 10A). Signal input optocoupler isolation, anti-interference ability. Color: Blue. 1 reset button & 1 general use button. Can be directly connected with Raspberry Pi. 64 different kinds of Resistor. DC 12V-24V 8A Automatic Infrared PIR Motion Sensor. Best Value Protoshild board with Mini Board. The White-Rodgers 90-370 heavy-duty relay is a totally enclosed relay, which operates in any position. This relay provides general-purpose switching for heating and cooling applications. For heating and cooling applications and general switching. ESP8266 has powerful on-board processing and storage capabilities. - 1X ESP8266 Relay Switch Board. - 1X ESP8266 Transceiver. - Integrated TCP/IP protocol stack. - Integrated TR switch, balun, LNA, power amplifier and matching. Form C SPDT. 10A 120VAC, 10A 250VAC. 24VDC Coil. RELAY SOCKET WITH CONNECTOR (CRIMP TYPE CINNECTOR) UNLINKABLE. 5 Pin Relay Socket for Automotive. Very often there is more than one part available per application as auto makers often switch midyear. Module based on : NE555 chip. Power relay delay pull. For example : a resistor capacitor 100uf 100K T = 1.1 x 100000 x 0.0001 = 11 seconds. Delay module : Delay connect module. With relay indicator. With freewheeling protection relay. We believe EVERY CONNECTION COUNTS. Manufacturer TE Connectivity Potter & Brumfield Relays. Relay Type General Purpose. Coil Resistance: 86 Ohms. Mounting Type Chassis Mount. Power Consumption: 1.7 W.
Included with this sale is a 12" piece of solder wick to help remove the relays from the circuit board. 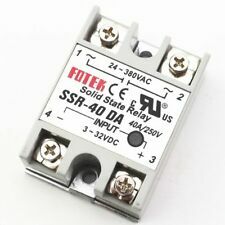 You need to have solder wick or a solder sucker to safely and quickly remove the relays. These drop in and solder directly to the fuse box printed circuit board of a Dodge Ram for the trailer lights not working. Low cost automotive relay with ISO 280 footprint. Optional to be equipped with diode or resistor. 1 reset button & 1 general use button. Can be directly connected with Raspberry Pi. 64 different kinds of Resistor. - Red working status indicator for each relay module. - Channel: 8 channels. Best Value Protoshild board with Mini Board. SJ Shipped with USPS First Class Package. Box is in sad shape relay is new. Relays are new and unused. I HAVE BEEN WORKING ON TOUCHPLATE SYSTEMS FOR OVER 45 YEARS. This model 2500B is no longer made. New model is a 3000. Problem is with the 3000. High 40A coil capacity- able to handle those high current applications with ease. 4X Relay Socket. Waterproof construction. Wire Specifications: White - Ground (85), Black- VDC (30), Yellow- Trigger (86), Blue- Output N/C (87a), and Red- Output N/O (87). Rated Current: 25A. Relay Size: 6.4 x 4.5 x 2.3cm/ 2.5" x 1.8" x 0.9" (L W T). Input: 80-250VAC. Product: 12V 80A relay. Feature: High-capacity, 80A switching capability. 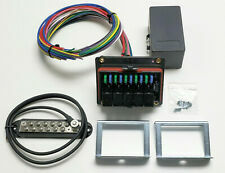 1 Set of car relay w/ socket. Installing form: Tri-clamp connection, socket mount. To ensure stability, industrial grade PCB board. PCB Size: 64 35 18mm / 2.52 1.4 0.7in (L W H). PCB Weight: 25g / 0.89oz. The use of opto isolated input and output, enhanced anti-jamming capability and consumption. SCL #: 67473. Mfg: KLIXON. RELAY 115 VOLT. RELAY 115 VOLT, COMMONLY USED ON WATER FOUNTAINS & BOTTLE FILLERS. WEIGHT: 0.5oz. (MADE IN UNKNOWN) BULK. World’s Largest Distributor of Excess Air Conditioning. 40 Amp SPDT Automotive Relays & 5-Wire Relay Sockets. Relays and sockets are used for many car electronic applications to turn on/off almost any device. They are also used when a device draws heavy amperage such as car alarms, remote starts, HID headlights, pop doors, trunk releases strobe lights, fog lights, stereos, fans, air horns, and much more. 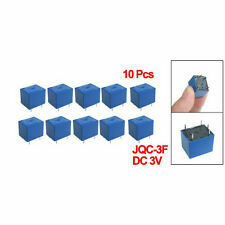 Use with any size suitable start capacitor. Pick-up Min. : 171. 1X 1 Channel Relay Module. - Green working status indicator for relay the switch. - Channel: 1 channels. Connection Setting #1. Connection Setting #2. You will be pleasantly surprised by our service. Choose from general and special purpose snap-action, tactile key, miniature, sub-miniature, thumbwheel, and DIP. Manufacture by Omron in USA. 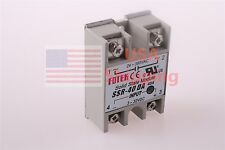 Qty4 12VDC 10A Relay(New Data Code). Multi-Purpose Relay. Soldering and cleaning. Available with an epoxy seal for automatic wave. 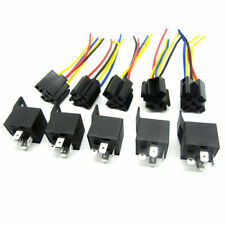 5pcs Car Relay 40A Auto Relay 4PIN DC 12V 40 AMP with Wire Plastic Socket. 5pcs x Relay Socket;. 5 Pcs x Car Relay. Pin Quantity: 4;. Main Color: Black;. Reply within 24hours. 500 Amp Battery Isolator and Relay. Fuses & Fuse Holders. Circuit Breakers, Isolators. CCTV Security Accessories. Adaptors & Power Supplies. Compatible with universal 12V Applications. Power Wire & Amp Kits. New Blue Display stand for Arduino Developers. New Green Display stand for Arduino Developers. 1602 Blue Display stand for Arduino Developers. 1602 Green Display stand for Arduino Developers. 0.96" Dual Stand for Arduino Developers. 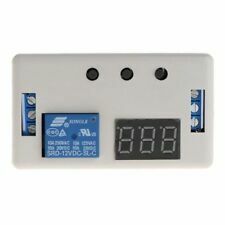 1X ESP8266 Relay Switch Board. - This relay is based on ESP-01S WIFI module. - Light weight,compact size,convenient to use. You will be pleasantly surprised by our service. This can only delay our service.